Me while waiting for surgery- No nurse call buttons and I was freezing w /2 blankets. 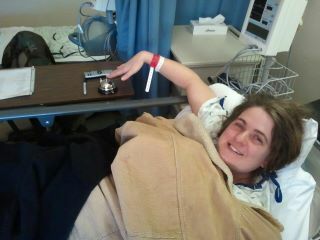 My surgery went well today they took out one of the nodes 3 were swollen. Praying for good test results as they seem to think it will be. It almost feels as if i had sliver removed. I think it needed to come out. I am sore and tired but blogging helps me to relax now that kids are all in bed. Tues broccoli soup with cheese and potatoes homemade. Thurs Goulash Daddy is the cook... He always helps with that anyways. Sun probably roast again I need more Sunday dinner ideas..that can be a throw it in the crock pot and forget it. I am so happy to report that today I received an email from another book company asking if I would like to review books for them. They have books from Howard Books, Thomas Nelson, Zondervan and others. Can't wait to see what they have although the first one they have asked me to review is Frank Perettis' newest that releases March 6th Illusion, His first novel in 7 years... hmmm Well I do not usually Review fiction like that nor read them however being that my son was so intrigued with Frank Peretti and has read all his novels I think I will check it out. Well I Really need some sleep as I did have surgery today and the house is silent ... Good night all and thanks for the prayers for my recovery from those of you who I have spoken with. Hope your recovery is quick. I have not read Peretti but have heard wonderful things about his writing. Good luck with the reading challenge. I too am trudging my way toward a goal.